Snippets of Jack: "Justice? Hardly." Remember that classic bar fight that takes place in The Pirates of the Caribbean: Dead Man's Chest where pretty much everyone is htrowing stuff and sswinging their swords, including James Norrington and Elizabeth Swann. Then afterwards, Elizabeth agrees to set sail with jack Sparrow on the Pearl to find the chest with the heart of Davy Jones which is suppose to somehow save Will? Well, besides getting the ball rolling, the scene also gives some handy information to the antagonist of the movie: Cutler Beckett. You see, Mr. Mercer is still working for Beckett and they've got spies everywhere. One of which sees Elizabeth (badly disguised as a man in the bar) and reports this back to Beckett in his EITC office of Port Royal. Beckett plays around with his sword as a man paints a map on his wall. Beckett: "There's something to knowing the exact shape of the world and one's place in it. Don't you agree?" Words of wisdom from Lord Beckett. 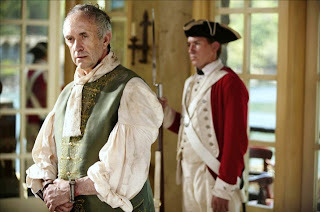 Governor Swann just stand there, with no wig, his hands bound by shackles and two Royal guards next to him. Swann: "I assure you, these are not necessary." Beckett: "I had you brought here because I thought ou'd be interest in the whereabouts of your daughter." He strangely points his sword in Swann's direction, as if there would even be a need to defend himself. Swann: "You have news of her?" Mercer: 'Most recently seen on Tortuga, and left in the company of a known pirate, Jack Sparrow, and other fugitive from justice." At the sound of the name 'Jack Sparrow', the governor just looks upward in frustration and despair: just the news he DIDN'T want to hear. But atleast she's still a live. Swann: "'Justice?' Hardly." What a slap in the face to the government he belongs to. They just ignore his insults. Beckett: "Including the previous ownder of this sword, I believe." Beckett finally decides it's time to stop playing around with large pointy objects and puts away JAMES NORRINGTON'S sword. Beckett: "Our ships are in pursuit. Justice will be dispensed by cannonade and cutlass, and all manner of remorseless pieces of metal. I personally find it distasteful to even contemplate the horror facing all those on board." Hmmm. Then maybe you just shouldn't do it then? There he goes again, bullying the people with less power than him. He's trying to totally feak out the governor over what he is going to do the Black Pearl which now has his only daughter on it. Swann gets the message. Swann: "What do you want from me?" Beckett has his whole plan thought out. Beckett: "Your authority as governor, your influence in London, and your loyalty to the East India Trading Company." So pretty much everything except the life of your daughter. Not so nice of a bargain he offered to Jack Sparrow in our previous post. Governor Swann grows a back bone in this scene, finally standing up for something. Swann: "To you, you mean." Beckett just stares at him and then creepily walks closer. Beckett: "Shall I remove these shackles?" Well, he already asked you to so I suppose that would be the right thing to do. There was no good reason to arrest him in the first place but we all know what a greedy person Beckett is. Swann things these over for a few seconds before deciding. He holds out his shackled hands: "Do what you can for my daughter." Beckett gives a sly triumphant smile. He now has the government of Port Royal on his side, giving him wide discretion over his pirate hunting quest. Some other many begins to unlock the chains roughly. Beckett: "So you see, Mercer, every man has a price he will willingly accept. Even for what he hoped never to sell." The governor never wanted to pretty much sell his freedom and power away, but he had to inorder to secure Elizabeth's safety. Never should have done it in the first place, because the E.I.T.C. never caught up to Elizabeth until into the second movie, where she was able to sneakily work things out and sail off onto Sao Fengs ship. In the end, Beckett and the governor both die yet she gets to live. Beckett indirectly kills the governor, and Elizabeth indirectly kills Beckett, so all's fair in love and war?